Famed for its pristine beaches, lavishly-decorated temples and deliciously spicy food, Thailand is situated on Mainland Southeast Asia. Bordering Cambodia, Laos, Myanmar and Malaysia, Thailand is the 50th-largest country in the world, populated by over 68 million people. Popular attractions include the Grand Palace in Bangkok, Railay Beach in Krabi and Doi Suthep in Chiang Mai. 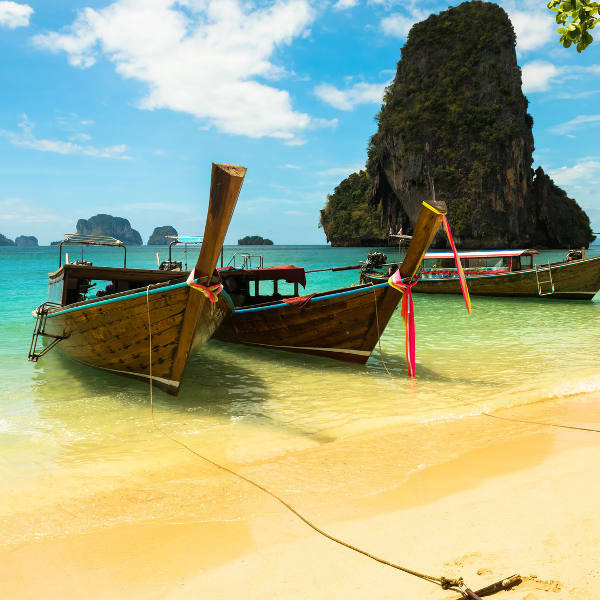 Get excited for tropical beaches and incredible Thai cuisine because cheap flights to Thailand are now available! Thailand’s hub airport is Suvarnabhumi Airport (BKK), a 40-minute drive from Bangkok’s city centre. Explore Thailand’s deep-rooted history and customs, stemming from pre-historic kingdoms and empires. Its opulent temples, ornate palaces and ancient ruins embody the rich heritage and reverence of the Thai people. Experience the powerful flavours of Thai cooking. From street markets to fine-dining, pull up a chair and enjoy the incredible dishes on offer. 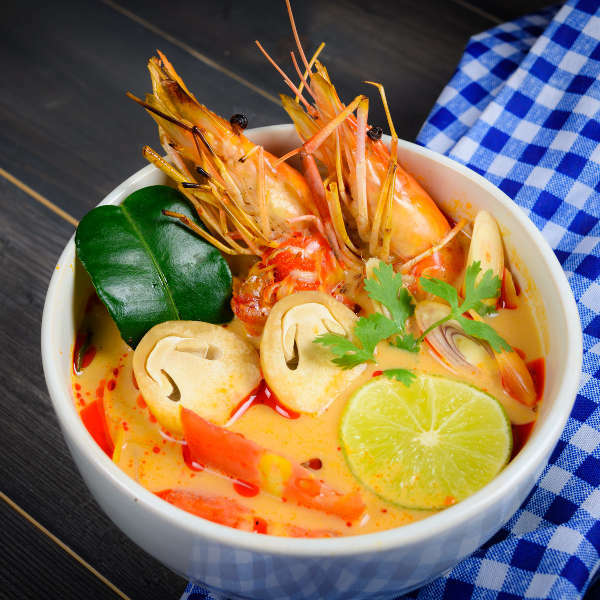 Bowls of tom kha khai and tom yum goong will leave your mouth watering for more. Thailand’s sandy-white beaches and turquoise waters backdropped by limestone cliffs, are the perfect setting for soaking up balmy summer days. Hop on a longtail and sail out to the islands, exploring the lagoons and exquisite marine life. Thailand experiences its peak season during summer, between January and April. To the north of Bangkok, days are wonderfully toasty while night temperatures can drop quite drastically. The southern region, however, experiences delightfully warm temperatures throughout the day and night. It is advisable to book flights and accommodation at least three months ahead, especially in more popular cities like Phuket, which sees a surge in tourists flocking to the beaches and island resorts. Be warned that summer brings crowds, traffic and high prices. April is often the hottest month of the year and marks the start of the new year, with festivals and street parades celebrating “Songkran”. If you’re not up for rowdy street parties, big tourist crowds and being doused with water, avoid visiting during the month of April. Thailand’s low season is between the rainy months of May and October. 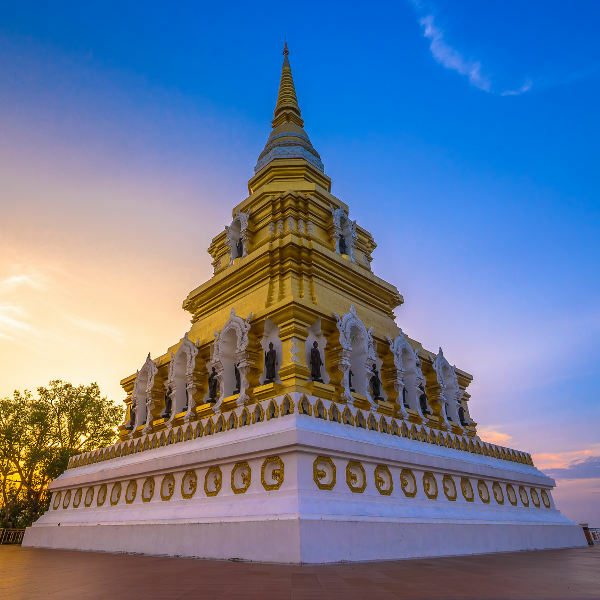 If you don’t mind the occasional rain shower and cloud cover, this is a wonderful time to explore Thailand’s temples, beaches and rainforests without the crowds, at half the price! Thailand is a place like no other. It’s warm hospitality, intriguing culture and incredible cuisine will creep into your heart. Whether you’re looking to experience the heady nightlife and party scene, indulge in massages on the beach or trek through the lush jungle rainforests, Thailand has it all! The capital city, Bangkok, boasts opulent temples, palaces and bustling night markets. Northern Thailand is vastly different from the south, appealing to those looking for an authentically rich experience of the landscape and its people. Chiang Mai is home to spectacular jungle trekking and zip-ling adventures, with elephant sanctuaries and ancient ruins along the way. To the left, Chiang Rai’s Phu Chi Fah mountain offers breathtaking views of Laos and the Mekong River. The sparkling Wat Rong Khun (White Temple) and Singha Park are also worth visiting, while the lush scenery and rice fields of Pai are equally exquisite. The south of Thailand is renowned for its pearly-white beaches and islands. Phuket boasts charming beach villages and is a gateway to the islands. Koh Lanta is a backpacker’s paradise and a stone’s throw from the Phi-Phi Islands; while Koh Pha-Ngan is hippie central, notorious for its wild full moon parties. Koh Samui and Ko Kut appeal to more refined travellers, with beach resorts and diving spots aplenty. Compare several airlines, and book your cheap flights to Thailand online at Travelstart! Thailand is by no means a dangerous destination, but a high level of vigilance and caution is required, especially for solo travellers. Theft, scams and motorcycle accidents are the major hazards to be aware of. Drinking on the beaches and in the streets is a way of life, but after indulging in too many vodka buckets, some tourists find themselves in compromising situations. Drug possession carries serious consequences and law enforcement officials do not show lenience to foreigners. Thai people are very friendly, but don’t mistake their charms for security, as many will try and scam you into buying their tour packages and souvenirs. Tuk-tuks are a great way to get around major sites, especially in Bangkok, just be sure to negotiate a fare rate before getting in. Travellers do not require any vaccinations to enter Thailand, although it is advised to be up-to-date with routine vaccinations. Depending on which areas you’ll be travelling to, you may want to consider being immunised against typhoid, hepatitis A and hepatitis B. Rural areas carry the risk of malaria and dengue fever, so be sure to pack in mosquito repellent as a precaution. Medical facilities are scarce in rural parts so ensure you bring along any prescription medication. Basic medical supplies are always a good idea, especially for insect bites, jellyfish stings, traveller’s diarrhoea and skin rashes. Ensure you stay well-hydrated and use a strong sunscreen for those tropical summer days! A comprehensive travel-insurance policy to cover theft and medical expenses is highly recommended, before departure to Thailand.